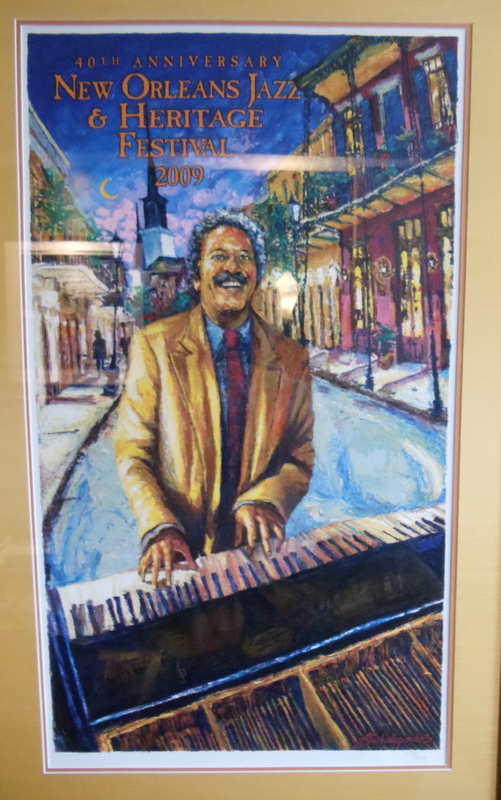 Toussaint as subject of the 2009 New Orleans Jazz & Heritage Festival poster. 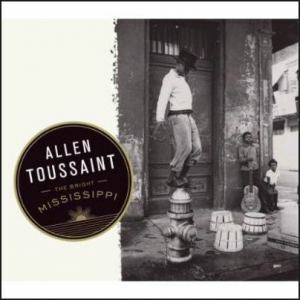 Allen Toussaint was inducted into the Rock and Roll Hall of Fame in 1998. His accomplishments are many over a career that has spanned five decades. 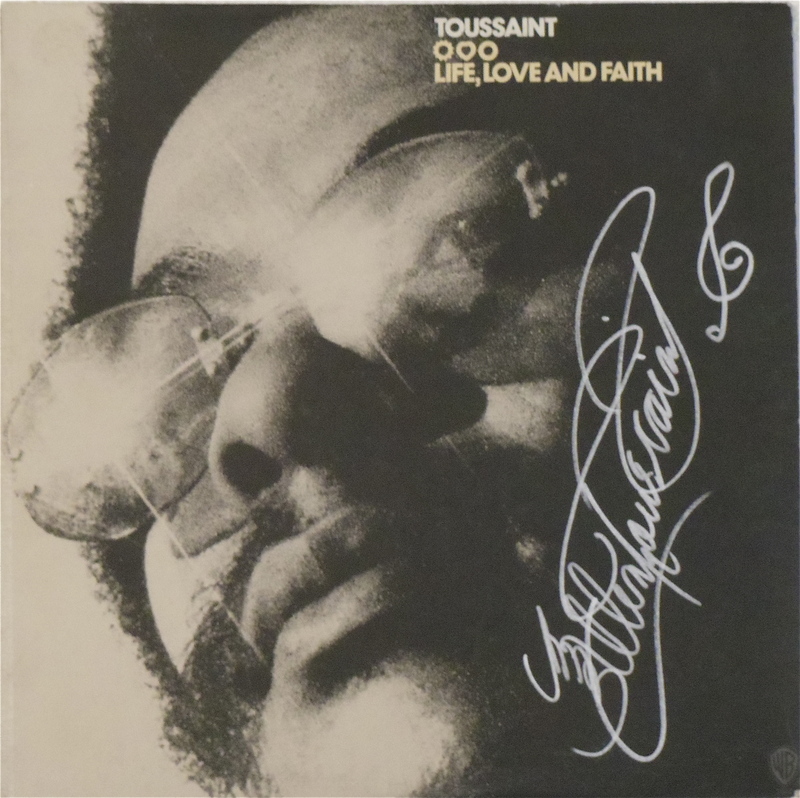 As a writer and producer, Toussaint was largely responsible for the second blossoming of New Orleans R&B (in the 60s), creating such hits as Working in a Coal Mine, by Lee Dorsey, Mother-In-Law, by Ernie K. Doe, Ruler of My Heart, by Irma Thomas, Fortune Teller, by Benny Spellman, and many, many, more. Artists ranging from The Rolling Stones, The Who, and The Yardbirds, to Devo, Boz Scaggs, Maria Muldaur, and Warren Zevon have recorded his songs. More recently, Robert Plant and Allison Kraus covered Fortune Teller on their album “Raising Sand.” In the 70s he got funky, as he worked with The Meters, Dr. John, and The Wild Tchoupitoulas. He also started working with artists from outside New Orleans, such as The Band, Robert Palmer, Paul Simon, and LaBelle, among others. Glen Cambell’s cover of Southern Nights topped the Pop, Country, and Adult Contemporary charts in the late 70s. More recently, he collaborated with Elvis Costello on “The River in Reverse” in 2006, and released “Bright Mississippi” in 2009. I interviewed him by phone a week or so prior to his appearance at the 2009 Twin Cities Jazz Festival. He proved to be a gracious gentleman in the true sense of the term – a gentleman who will stand when a lady leaves a table. This is a slightly edited version of that interview, which was broadcast on Rhythm and Grooves on June 20 of that year. LE: What’s your first memory of music? AT: My first memory of music at all was when I was about six and a half. They brought a piano to my house for my sister, this big upright, and they set it in the front room. I saw this big piece of furniture. I knew it was a musical instrument, and walked over and reluctantly touched it and it gave me a pleasant sound and that was it. LE: Did you start playing by yourself, did you take lessons? AT: Well, I must say that I started picking out little simple melodies. It seemed like really soon I saw the structure – two black keys, three black, two black. My sister began taking music lessons and she saw me trying to pick out little simple melodies. She would show me this, what you’re pressing here, is there on the page. So I began to understand a bit of theory – innocent theory – as well as picking out little single finger melodies, what I would hear on the radio, and hear people sing. LE: Who was the first musician that you admired? AT: Oh, well, everything I heard on the radio, I thought every musician knew how to play that except me. I just thought there was one big conglomeration of music out there, and everyone who plays it can play everything. When I did begin to pick out particular people, I’d been hearing boogie woogies and things like that. Just hearing the records, not knowing who it was, it didn’t matter who was what, I was just trying to learn that. But I must say the first influence from people who were recording was Professor Longhair. That I really paid attention to. This was off the beaten path. I better take note here. LE: And did you search him out. I know you eventually got to meet him. AT: Oh I got to meet him many, many years later. I heard him when I was 8 ½ – 9 years old, but only saw him for the first time when I was 16. At that moment, I didn’t dare talk with him, because I didn’t feel I had the right to yet. But I saw him one time at what they called the sock hop, and it was for about a half hour I saw him playing a Spinet piano. Then I met him later on when I was like, 18. I saw him and actually spoke with him briefly. We weren’t at a piano, he was somewhere doing another kind of labor job. Later on, over the age of 20, I began to see him around town playing, and I would go in. LE: Certainly at that point you were already playing as a professional musician? AT: Oh Yes, yes. I started playing professionally at 13 with Snooks Eaglin and some neighborhood cats. LE: Oh that’s right, in that group the Flamingos. LE: Now was there a particular point when you realized you could actually make a good living as a musician? AT: Well, when I was 12 or 13, I thought I would be playing music forever. It hadn’t dawned on me whether it would make a lot of money. I hadn’t thought about that because as a kid living with your parents, it wasn’t necessary yet. But I thought that whatever in my life, I would be doing this, and when it comes to making a living I would be doing this wherever people do this. LE: So, you started out playing piano, and at some point you started arranging and producing. How did that occur? AT: Well I started arranging early on with that band, The Flamingos, because we were playing cover songs by Ray Charles, Fats Domino, and various things. By me playing the piano and listening constantly I could many times give the horn players the parts that were on the recording. So I started arranging, innocently, in that band. And of course, being a studio musician, I became a sideman in the studio, which gave me a little more experience at giving parts to horns and other people. LE: You did some work with Dave Bartholomew as well? AT: Oh yes. Dave Bartholomew was extremely important, and I would say my mentor as far as the business part of the industry and what we do. He called me in once to play, well he called me in to play on a couple of sessions beforehand, but one that was a milestone was I went to play on three songs of Fats Domino’s. We were up to multi track, two-track recording, where the band could be on one track and the vocalist on another. They had a deadline for a record to come out and Fats Domino was touring in Europe, so Dave needed to have that ready for him when he got in, cause he’d be in New Orleans only a short time. So we went in and I played the piano as Fats would on a couple of new songs. And it went very well, and when Fats came in, he put his voice on it. One of the highest compliments in my life, was a year or so later, when Fats Domino said, “I don’t know if that was me or you.” I just thought that was delightful. LE: It certainly sounds that way. What song was that? LE: You started producing and arranging on your own. What kind of things did you learn on your own as a producer that led to your success doing that? AT: Well, being a side man in the studio I learned the process of what takes place, of what needs to be done, and who calls the shots. So when Minit Records started, I became the A&R man, [Ed note: Artists & Repertoire] which later we called producers. But by being a sideman in the studio before then, I knew the process. So Minit Records started up and I became the person who was responsible for all the music being made. That was my initiation into being a producer. LE: And then, you eventually branched out from just producing New Orleans artists to producing The Meters, which had a different sound, and then national artists would come to you, folks like The Band, for instance, and ask you for some horn charts. Did you find you had to change your approach to work with folks from outside New Orleans? AT: Not really. Of course, The Band was a unique situation because I wasn’t operating as a producer, just a horn arranger, which was wonderful as well. But producing other artists from outside, like Joe Cocker, Frankie Miller, Patti Labelle, or Ramsey Lewis? No my approach didn’t change as far as my process. I would think differently about whoever comes in with whatever music would go with them, so it all wouldn’t sound like it’s just one kind of music, and whoever comes has to fall into that. I thought everything should be sort of tailor made, because I just feel that way about things. But my basic process and approach didn’t have to change. LE: Were there any records that were disappointments in that you thought they should have been a hit and weren’t? LE: The hit is kind of an ephemeral thing. It’s out there and maybe you grab onto it, and maybe you don’t. LE: This is a wonderful, wonderful album. It encompasses some music that is almost a century old, as well as including music from Mingus, and Duke Ellington, yet it doesn’t seem like a museum piece at all – it’s really right there. You worked with Joe Henry, who’s become well known for working with artists who have been around for a while, and it’s come out very modern. How did you work with Joe to choose the songs? AT: Well Joe is responsible for just about everything there except the playing of the piano. He had the foresight of just what this should be, I believe, and I think it came out the way he thought it would. He chose all of the songs, and the musicians, and the studio as to where and when. I am so glad he did cause it was quite comforting to have someone to assume such a broad position. LE: One that you usually have. AT: Yes, he did it so very well, and does it well all the time. He did it with such dignity, and he chose such fine material. LE: And fine musicians to accompany you. AT: He did the best he could and I must say this is quite a prize, to be in this collaboration with Joe. LE: He did the arranging? How did that work out? AT: I must say that you couldn’t say there was an arrangement at all. He guided us into whether this should be a duet, that should be a full complement. Those were his ideas, and the business of having two pianists on that song, the Jelly Roll Morton song, Whining Boy, that was his idea. Each one of those combinations was Joe’s idea. He was truly the sole producer here. LE: In some respects, it’s an album of traditional music, and traditional music is really a big part of what goes on in New Orleans music. When I was down in New Orleans for Jazz Fest, I recall stepping out on Frenchman Street and finding a bunch of young people in a brass band – I don’t think anyone was over 18 – and they’re playing a lot of traditional stuff. AT: Oh yes, It’s a part of who we are. LE: Talk about tradition a little bit, and how it works in New Orleans. AT: Well, tradition is like holding on to that old world charm. And we do that in more than a musical way, in the structures, the buildings, the streetcars, the food. New Orleans really holds on to the old world charm as much as possible. And when you’ve got a brass band that moves through the street, there are certain things that are going to happen and certain things that are not going to happen. The most obvious things to happen are traditional, because there’s a reason why that music existed, and even without it being announced, that reason was strong enough to still prevail. The sound and nuance of that music is still there. LE: Are there any new projects you’ve got coming up? AT: I’m contemplating things to do in the future, but I must say my primary focus is on the best presentation, live presentation for this new music, from the new album. That’s where my head is mostly now. LE: Well, thank you so very much for taking the time to talk with me. This entry was posted on Sunday, June 12th, 2011 at 11:38 am and is filed under Interviews. You can follow any responses to this entry through the RSS 2.0 feed. You can leave a response, or trackback from your own site.